Battersea Dogs & Cats Home’s plea for old tennis balls has been answered by the organisers of one of London’s top tournaments. 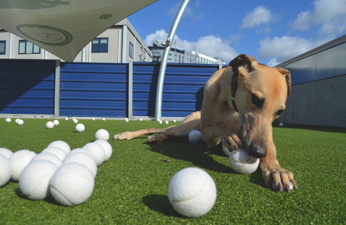 The Queen’s Club, which hosts the Aegon Championships, has sent the animal charity a batch of balls used by stars during the pre-Wimbledon event, which was won by Andy Murray. Carly Whyborn, head of operations at Battersea, explains: "Tennis balls are one of the most popular toys here at Battersea – our dogs can’t get enough of them." The home's 400 dogs chomp their way through a couple of thousand tennis balls each year, which is why the appeal is continuing. Carly adds: "We’re calling on members of the public to donate much-needed tennis balls at our Annual Reunion and Fun Day on Sunday 9 September. It’s a great day out for families in Battersea Park, so if you can join us with your dog – and some tennis balls – it would be great to see you."